Do you use visuals on your blog and social media? Have you considered animating them? 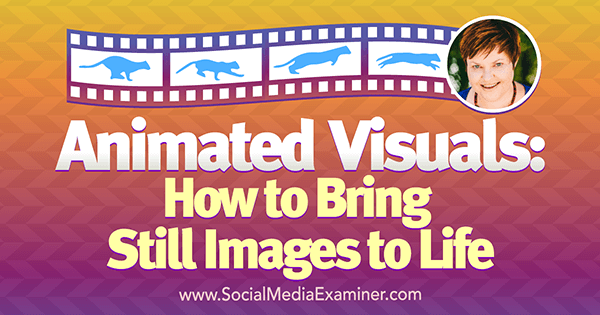 To explore how to use animated visuals in your content, I interview Donna Moritz. 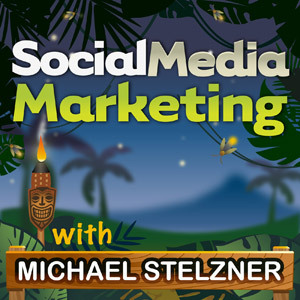 In this episode, I interview visual marketing expert Donna Moritz. Her blog Socially Sorted was recognized as one of Social Media Examiner’s Top 10 Social Media Blogs in 2015, 2016, and 2017. Donna explores three popular types of animated images. You’ll discover tools to easily animate your own images. 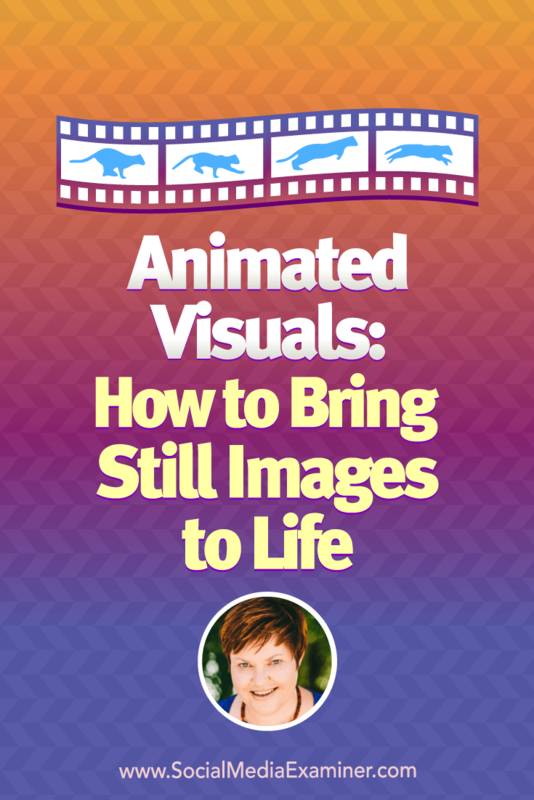 Animated Visuals: How to Bring Still Images to Life featuring insights from Donna Moritz on the Social Media Marketing Podcast. As people scan their social media feeds, they’re making lightning-fast decisions about what content they’ll pay attention to. In this context, animated visuals add a little bit of movement that can attract the eye and add value in a short, snappy way. Donna explains that short animations can be less intimidating to create than video. Animation is simply combining drawings, photographs, text, or computer graphics to make them move. You don’t need to talk in front of a camera. Short animations can also be a way to develop your audience. Donna says if you can make a strong first impression with a short animation, that animation can encourage viewers to watch longer videos and further engage with your content. Listen to the show to hear Donna discuss the findings of a small MIT study that investigated how quickly people interpret images. Donna says that quick animations aren’t divided into formal types, but you do tend to see a few common approaches. In a one- to three-second animated image, the background is typically fixed and only text is animated. For example, she points out, Social Media Examiner does these on Instagram. She says you might also see a mini slideshow. A GIF is a silent animated loop often used to convey a feeling. GIFs have become hugely popular on social media. GIFs started appearing in blog posts and emails but have spread to messaging apps like Slack and Facebook Messenger. For example, in a blog post about social media strategies that drive her crazy, Donna says the only way she could express her frustration was with a Muppet GIF from Giphy. Use a GIF to convey a feeling. Finally, Instagram and Snapchat stories enable you to blend and share quick successions of images or videos. All of these types of content are easy to create because so many tools are available. Listen to the show to hear about audio in short video. In blog posts and in email, GIFs are a great way to highlight particular emotions, add humor, or simply break up the content. Donna says she once sent out the wrong email to her subscribers, so she used a GIF to apologize. However, you need to be careful about how you use GIFs. Donna recommends using GIFs sparingly. In a blog post, use no more than two GIFs, and in email one is enough. Donna says too many GIFs are like strobe lights going off at a nightclub. When you insert a GIF in an email, Donna suggests checking the file size and compressing the GIF before adding it to your email message. When you compress the GIF, the email message is less likely to be truncated. Donna and I talk about how a GIF animation is also powerful for how-to content. A simple looping GIF can help you introduce a new feature or explain how to do something. However, Donna says to use GIFs only for simple how-to content that’s short and to the point. People don’t want a how-to GIF with 50 steps. That type of content would be better as longer-form video. I ask Donna whether autoplay is a benefit on social media. Donna says GIFs typically autoplay on websites, email, and messaging apps. However, on social media platforms, GIFs may or may not autoplay, depending on the platform and the user’s settings. For example, Donna says she turned off autoplay on her phone and many social platforms are press-to-play. If you want to ensure your GIFs autoplay, you can experiment with exporting them in a video format on different platforms. However, Donna says you need to be aware of issues specific to the platform you’re using. On Facebook, for example, most people have video set to autoplay but video views count only after three seconds. Listen to the show to hear Donna and I discuss the pros and cons of looping. Donna shares tools for animating text, creating short slideshows, and turning videos and screen captures into GIFs. To create text animations quickly and easily on your mobile phone, Donna recommends Adobe Spark Post. Although you can use Adobe Spark on your browser, the animation function is available only on the iOS mobile app. Click to animate images using the Adobe Spark Post app. 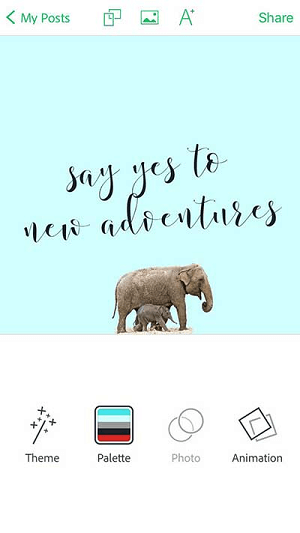 With Adobe Spark Post, you choose a template and customize the photo and text. Then use the animation options to select how to animate the text. For example, the text can blur, slide, or fade in. The app is free and offers a fast, simple way to make one- to three-second animations. For slightly longer videos of up to 30 seconds, Donna recommends Ripl and Legend, which are both available on iOS and Android. With Ripl, you can upload up to eight images, add text, and create a slideshow that the app will convert into a video (not a GIF). For example, Donna says a personal trainer might show how to do a simple exercise or a real-estate agent could showcase different homes. The slideshows are great for Instagram and Facebook videos. Ripl offers different templates and for more features, you can upgrade to Pro for $9.99/month. With some templates, you can change the text at the bottom, whereas others enable you to change the text on every slide. Unlock your potential 🔑 Use today’s free design of the day to make an impact on your social media! Legend allows you to animate text on several slides and you can choose colors, filters, and image backgrounds. Legend doesn’t have the ability to create slideshows of images the way Ripl can. Although Legend, unlike Adobe Spark Post, can animate text across several slides. Next, Donna shares a couple of options for creating GIFs. The main GIF website is Giphy.com. It’s the biggest search engine for existing GIFs if you want to find one to share. However, Donna says Giphy.com also has excellent tools for making your own GIFs. 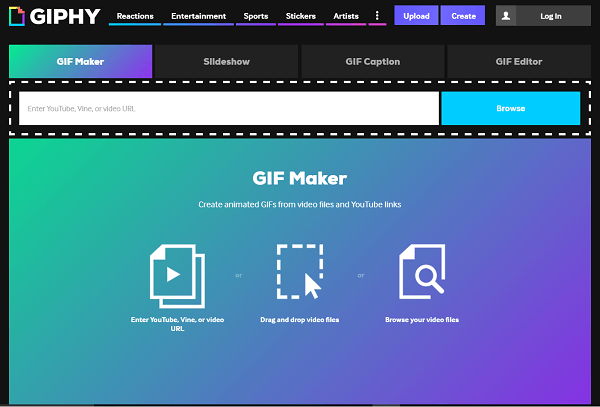 If you add a video link (like a YouTube link) or your own video, the GIF-creation tool allows you to choose where your GIF starts and ends. The tool also lets you add different effects such as captions, subtitles, animated text, and emojis. If you want to make a slideshow GIF instead, Giphy.com has a slideshow tool that allows you to drag and drop images. Donna adds that Giphy.com lets you work super-fast. If you have existing content, you can create a slideshow or a GIF mashup of that content. With all of the different stickers and options, Donna says the key is to create something eye-catching without overdoing the effects. Giphy enables you to make GIFs easily from your existing content. Another option is to do a screencast, which businesses like TechCrunch and Buffer use to share how-to content. For screencasts, Donna recommends two tools, both of which are desktop apps for Windows or Mac. RecordIt is specifically for creating GIFs. After you download the app, press Record and drag a frame to where you want to record the screen. Then RecordIt makes a GIF from the recording. It’s a great way to quickly create content to get a message across. RecordIt has a Pro version for Mac for $29. RecordIt takes your screen capture and turns it into a GIF. 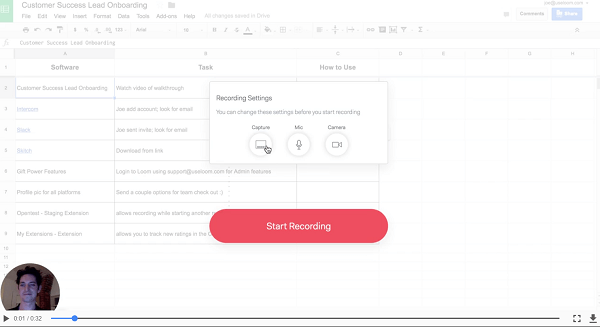 The second tool, Screencast-O-Matic, allows you to take a quick screencast. Donna says this tool is less expensive than ScreenFlow or Camtasia and is useful if you’re working between two operating systems. For screencasts longer than 15 minutes, you can upgrade to Pro for $15/year. What Donna loves about Screencast-O-Matic is you can save your files, share on YouTube, upload them to Facebook, whatever. Then with a simple click or two, you can change the .mov file into a GIF. Use Screencast-O-Matic to create and share short screencasts. Donna adds two simple tools for creating animations that are both available on Android and iOS. The Boomerang app on Instagram is a quick way to add movement to your image. The app creates a short video that loops back and forth. Phhhoto does something similar: It transforms a photo burst from your camera into a forward-backward loop. Listen to the show to hear which tools Donna recommends people use to start. On Facebook, slideshows can help you expand the reach of your content. 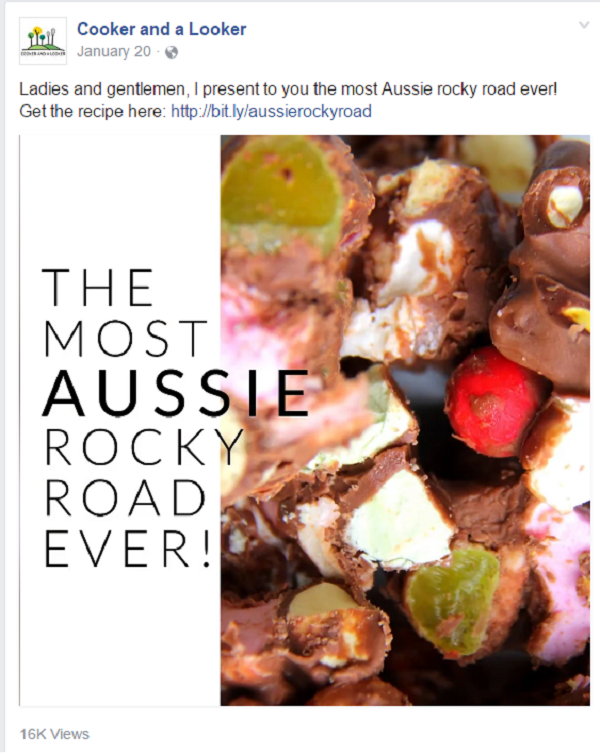 For example, Donna mentions Amanda, the Australian blogger behind Cooker and a Looker. After reading one of Donna’s posts about animation, Amanda created a video made of images and posted it to Facebook. Amanda ended up with huge reach for her page and more than 3,000 visits to her website. To create the post, Amanda used Facebook Slideshow. Combine images to create a video post with Facebook Slideshow. To create a video with Facebook Slideshow, go to the top of your Facebook page and under your status bar, select Share a Photo or Video. When more options come up, click on Create Slideshow. Next, upload 3 to 10 images. Then choose your aspect ratio (square, vertical), change your image duration (from 0.5 seconds up to 5 seconds), and add basic transitions and music. Then it’s a matter of publishing the slideshow to Facebook. Listen to the show to learn why Donna thinks Facebook Slideshow is a great tool for businesses. Try to create something original, Donna suggests. Anything new or different always stands out. If you have previously used content or your own new images, use your own content instead of the images that come with templates. Then start playing with the tools. Mix things up with GIFs and short video, and optimize them for each specific platform. Some things will work better on Facebook, others on Instagram. Make that first view of the image eye-catching. For instance, Sue B. Zimmerman does Instagram posts with animated titles on her images created using the GIF tool. Remember that sometimes subtle movement can be just as powerful as a video. Listen to the show to discover why the image may be more important than the content in your description. Loom is a free Chrome browser extension that creates a shareable video as soon as you finish recording. When you want to share how something works or speak to your audience, Loom is a great way to communicate, especially when video is the ideal way of communicating your message. Listen to the show to learn more and let us know how Loom works for you. Learn more about Donna on her website and read her blog. Follow @SociallySorted on Twitter, Facebook, Instagram, and Pinterest. Check out Social Media Examiner’s 2015, 2016, and 2017 Top 10 Social Media Blogs. Read about attention spans, the website attention studies, and MIT impression research. Take a look at Social Media Examiner on Instagram. Read Donna’s post on social media strategies that drive her crazy. Explore Adobe Spark Post, Ripl, Legend, and Giphy.com. Learn more about TechCrunch and Buffer. Take a look at ScreenFlow and Camtasia. Play with the Boomerang app on Instagram and Phhhoto. Check out Cooker and a Looker and look at Amanda’s Facebook post. Take a look at Facebook Slideshow. Follow Sue B. Zimmerman on Instagram. Watch our weekly Social Media Marketing Talk Show on Fridays at 10 AM Pacific on Crowdcast, or tune in on Facebook Live. What do you think? What are your thoughts on animated visuals? Please leave your comments below.